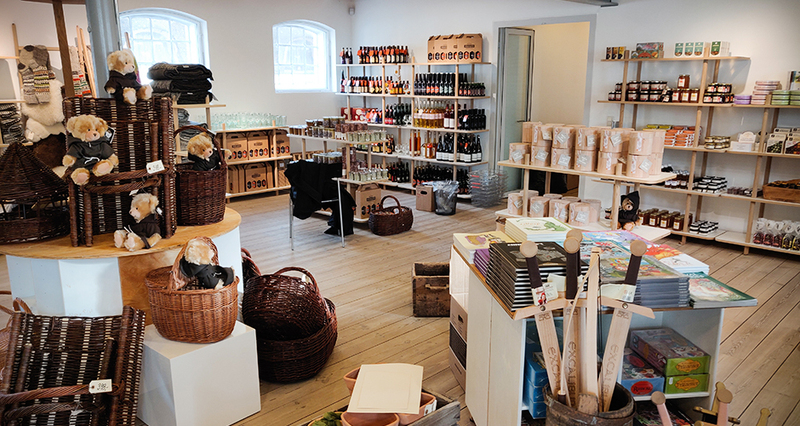 Dive into our vast selection of goods on the shelves in the arched basement of the abbey. Notice: The shop is moved to Esrum Millfarm due to renovation. You will find a wide selection of Esrom’s homemade products such as beer, schnapps, rye bread, honey, medieval custard and much more. Furthermore we have imported many great things from French monasteries, ranging from soaps and creams, to confits, pickled fruits, paté and cheese. On the shelves you will come across a lots of local sourced quality ingredients such as organic flour, honey, lemonade, wine, seasonal vegetables, toffees, marmalade and lots more. You can also get medieval-inspired non-food items such as wooden trays, play swords, clay mugs, bone spoons, bread scoring tools, tray throughs, wool and socks, posters, books and much more in addition to our delicious edibles.